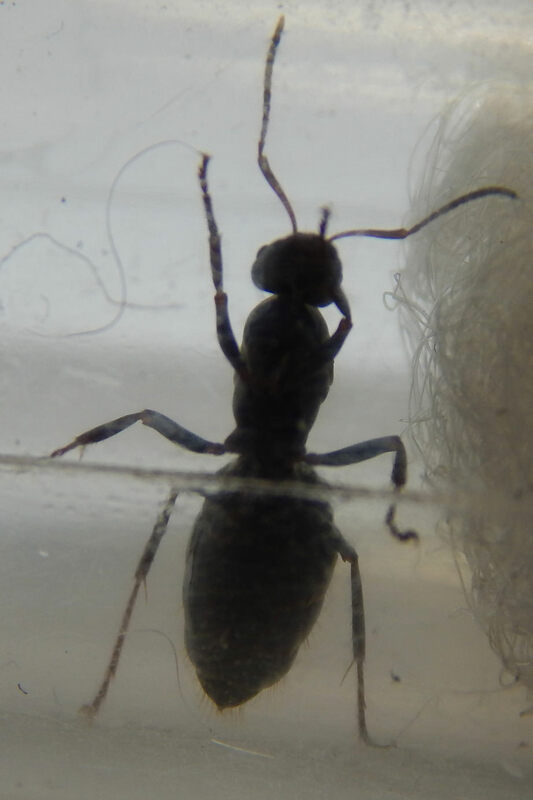 And here we go I'm 90% sure shes Formica Sp. but it's always good to ask and take away that 10% worry. Most definitely a Formica sp. of some sort. Actually looks like Formica fusca to me. Looks like Formica to me to, just not sure about F. Fusca. Yeah they definitely are not my best pictures I was in a rush (combination of wanting to get her set up quickly and the fact I was in between errands) and saw her scurrying awfully close to a hunting tetramorium colony... and I've seen what they can do to a queen... so it was a quick photoshoot and off to chores updated pictures soon. so that proved difficult, just one... she was not very happy with the light which is not to suprising, its just a silhouette kinda shot but it shows the hairs on her gaster and some of the hairs on the legs... plastic tubes do not make great settings for pictures. Last ones for now, had a thunderstorm so lighting was bad but better than last night . Based of the shininess then yes it is Formica Fusca. Thanks. Come to think of it her and the few others I saw dart passed Me were exceptionally shiny even for ants.. didn't even dawn on me to post that observation.